Last night I attended the Cabinet Resources Committee, a meeting with a packed agenda and a very packed room. A large number of people were there to hear about the sale of the Hendon FC ground, something which has been causing controversy for several years. London Jewish Girls High School (LJGHS) had apparently put in a higher offer for the site but this was not considered by the council. Cllr Dan Thomas reassured the committee that he had taken legal advice and that he was sure Barnet Council were in the right. However if you pop over to the Barnet Eye’s website you will see a letter from LJGHS legal advisors, Flagates, threatening the potential of a judicial review if their bid is ignored. Looks like the council lawyers will be clocking up some fees then. I had submitted some questions regarding the £750 million outsourcing. As ever, I ask questions and the council do their best to avoid answering them. • Any procurement savings have to come back to Barnet Council – Note to Barnet Council you may need to put some serious resources into checking to make sure it happens. • Cheap and cheerful won’t cut the mustard. Barnet want good quality and cheap – Note to Barnet Council this may be very difficult to achieve so don’t be surprised if one or both are not achieved. • Savings have to be generated from day one. Interestingly Cllr Thomas illustrated how Barnet Council made £29 million of savings last year alone without the help of BT or Capita, so why we are outsourcing to save another £39 million over the next ten years seems puzzling. • Check to make sure some of the contracts you are hoping to re-tender haven’t been extended by Barnet. • Any savings you show in your bid are guaranteed according to Mr Cooper – BT and Capita please note you are on the hook so no whinging when it goes wrong. • If you are planning to put your call centre in Bangalore you will probably get away with it so long as it is cheap enough, even though other Councillors may disagree. Some of the councillors undertook a study and recommended that you should assist the council in creating local job opportunities, graduate trainee opportunities, apprenticeship opportunities and sub-contract parts of the supply chain (where possible) to local companies within the borough. • I hope Liverpool and Sefton have nice things to say about you if Barnet take up references with them, although do they really want to hear bad news, maybe not. • If you plan to “channel shift” - getting everyone to deal with you via the internet - you’ll probably get away with it, so long as it saves money. However, lots of people in the community prefer to deal with the council face to face or on the telephone. Sadly the rest of the meeting went through at a fast pace with Cllr Coleman shouting agreed to every item – he was obviously in a hurry to get off somewhere. Item 15, the building cleaning contract was withdrawn, I wonder why? So yet again the rubber stamping experts at Barnet showed their prowess at minimising debate. How very efficient – how very undemocratic. Barnet Council published their supplier payments for January yesterday. Sadly the Council's love affair with their One Barnet implementation partner shows no sign of waning. In January Agilisys were paid £270,719.50 or just under £13,000 every working day of the month. In the year to date Agilisys have been paid £1.3 million and when coupled with the £642,050.64 they received last financial year they have now billed a shade under £2 million. That is £2 million to just one firm of consultants. There are many other consultants plying their trade at Barnet. Trowers & Hamlins have also done well out of One Barnet billing the Council £152,641.57 in January. Simply Performance Management Limited billed another £9,200 in January bringing their total fees for the year to date to £44,775. Now what is interesting about this company is that they specialise in Executive Coaching and have billed the Deputy Chief Executive's office. I wonder who needs that much coaching! In the week when Councillors confirmed the closure of Friern Barnet library it sticks in the gullet of many decent people in Barnet that the council should be squandering so much money on consultants for a strategy which still seems both unproven and high risk. News reaches the Bloggers of Barnet that poor old FM Conway have dropped out of the bidding process for Development and Regulatory Services contract. "The council has received confirmation that EC Harris is now the sole partner in the EC Harris and FM Conway consortium, as FM Conway has decided to withdraw from the process. EC Harris is one of the short listed bidders for the Development and Regulatory Services (DRS) project, the other being Capita Symonds". I wonder how many other One Barnet watchers are speculating long it will be before EC Harris read the writing on the wall and see that Capita are now a shoo in for the contract. Last night's cabinet meeting was a tragedy. All the local residents who have been working hard on alternative options to the closure of Friern Barnet Library were dismissed out of hand. Cllr Rams had tweeted earlier in the day that the decision to close Friern Barnet Library was made last year. Why then, asked one of the residents, had they encouraged them to come up with alternative plans. Good question no real response. Why is Friern Barnet Libraray being treated differently from Hampstead Garden Suburb Library. Hmm. Doesn't need a genius to guess the answer to that one. Residents opposed to private events in public parks, dismissed. Budget cuts nodded through. Sadly for East Barnet is was confirmed last night, in the response to a question put forward by Barnet Bugle proprietor Dan Hope, that parking charges will be introduced in Church Hill Road car park. The income generated from introducing charges in 6 currently free car parks is only £6,000 a year, an average of just £1,000 a year from each car park. So do you think that this will help the traders in East Barnet village at a time when so many shops are struggling. I don't think so! Two East Barnet Councillors sit on the cabinet and have agreed the introduction of these charges. Cllr's Joanna Tambourides and Robert Rams should hang their heads in shame, oh no sorry they don't do shame. That was quite apparent last night. Set out below is an open letter to The Chief Executive and Leader of Barnet Council. This matter has been brought to the attention of the Barnet Bloggers but such is the concern that issues like this may get 'buried' because of the current outsourcing process, that we have taken the step of publishing this letter on our blogs. If not then the rest of our questions are not applicable. - Are these individuals currently employed by the authority? - If one or more of these Directors are Council employees, can you confirm that it is not a breach of any regulations for employees to set up a private company whilst still being paid by the Council that will deal directly with services directly associated with their current employment? - Furthermore please confirm that they may continue to have access to confidential data, and that this would not secure unfair advantage over any other possible bidders for these services? - Do you know how many Barnet schools have given notice that they are terminating their contracts with Barnet Council Financial Services? - When did they give notice of termination? - What reason did they give for termination? - How many schools have signed contracts with FINANCE MATTERS FOR SCHOOLS LIMITED? - Have there been public and private discussions amongst senior managers on the creation of this new company within the Council? Southwest One, a joint venture between Somerset County Council, Taunton Deane Borough Council, Avon and Somerset Police and IBM appears to be in yet more trouble. "As an administration we inherited a partnership that promised a huge amount, but it was not delivering. Southwest One’s accounts year on year show losses, staggering losses just published of £31million, and failures to hit modest savings targets. We have bent over backwards to try to make this partnership work, but we have to state clearly that our primary duty in looking after the public’s hard earned money is to make sure we get the best possible deals, that we get the best possible value for the public’s money. I have to say that Southwest One is failing this test. We are currently looking at all our services and all our contracts to see whether we are doing the best we can for our customers, whether we are providing the best possible services for our customers and at the best possible prices for our customers. I have to say that Southwest One is failing this test. We need a council that can cope with future government cuts and rising demand. We will need to be efficient and flexible. I have to say that Southwest One is failing this test. Sadly, Southwest One is failing. It is failing to deliver promised savings; failing to cope with a changing financial landscape; failing to be flexible enough to adapt in challenging times and provide the best possible value for money. To make up for this failure, we will now accelerate our extensive review of everything that the council does. Almost half our most vital services are carried out by private sector or not for profit organisations – we will look to increase this where appropriate. We will encourage social enterprises, partnerships, communities and voluntary groups to get more involved in what we do and what we run. We will look to put the customer at the heart of what we do. And we will do this whilst we continue to do all we can to make Southwest One work. But I have to be clear; it is failing; it is inflexible; and it is intransigent. We are therefore looking at all the options available to us. I do have one final message for Southwest One – and that is to the staff and our Somerset County Council colleagues and secondees working there. The message is this - this continuing failure is not about you; it is about the contract, the complications, the failed technology, the missed opportunities, the lack of promised savings. It is about Southwest One itself, not about the people working for it." Now this is coming from the CONSERVATIVE Leader of the Council. Most sensible people would check to see is mass outsourcing is a good idea by talking to other people before signing up for a £1 billion contract. If I were Cllr Richard Cornelius I would be on the phone to Ken Maddock on Monday morning to double check if all the advice being fed by the numerous consultants advisors and senior officers is realistic or just plain b***s***. Experience at Somerset would suggest the latter is the case. The big concern about full time staff being paid as consultants continues to rumble on. This morning the Daily Telegraph reports on consultants being paid £350 and £375 a day for their services. Sounds cheap to me compared to the rates that are being paid to the numerous consultants in Barnet. Barnet’s own annual accounts for 2010/11 identifies 9 senior officers who are paid as consultants, but that is just the tip of the iceberg. I have seen the invoices to some of these consultants and the fees are quite shocking. A consultant who comes in, does a discrete piece of work and leaves moving on to the next project is one thing. But what we have in Barnet are people who have been working full time for over a year in a designated council post. Since it was discovered that the head of the Student Loans Company was a self employed consultant, this issue has gained some publicity but the Bloggers of Barnet have been going on about this issue for a very long time and have been completely ignored. Her Majesty’s Revenue & Customs have a very useful tool on their website - Employment Status Indicator - which helps to establish whether someone is an employee or a self employed in the eyes of the tax authorities and it is obvious to me that many of these consultants are technically employees. As well as avoiding tax this situation creates liabilities for Barnet Council which, according to the HMRC website includes the ability of these consultants to claim redundancy and claim for unfair dismissal. The time has come for Barnet to put its house in order and regularise the employment stays of its many ‘consultants’ and if councillors or the chief executive won’t initiate this process then it is about time that Eric Pickle did. Buried away at page 304 of the business planning document being discussed at next week’s cabinet meeting is a very interesting set of charts. They represent the corporate risk register and make pretty scary reading. “Street Lighting PFI Contract. Contractor has struggled to deliver the required standards and as a consequence has suffered large financial adjustments. Contractor has indicated this is not sustainable and has threatened to withdraw from contract. The financial implications could be up to 50% increase annually potentially equating to £2.25m annually”. The impact is rated as catastrophic and the likelihood as high giving an overall risk score of 20. The council are taking actions to reduce the risk including “proposed amendments to contract to improve sustainability” but the target risk is still a high 15. Now just imagine if the same thing happens when the two mega outsourcing contracts that are currently being tendered start going wrong. We will all be in the proverbial dog doo because they will be too big to fail. Now where have we heard that phrase before? “Development and infrastructure – Development within the Borough through the medium-term is planned to deliver 8,800 new homes and an increase in population of 20,000 by 2015. There is a risk that funding and delivery mechanisms will not be in place to deliver the necessary physical, green and social infrastructure to accommodate the requirements of an increased population”. This is something I and many other people have been banging on about for years. It is all very well planning all this expansion in Barnet but forever playing catch up with all the essential infrastructure that makes life bearable. They are planning remedial actions but the target outcome is still medium high meaning that there is still a good chance that this essential infrastructure will not be in place. There also remain very significant risks on waste management, something which has been identified in the past and for which the target risks remain high. I was considering asking questions about this at the Cabinet meeting but given the derisory way my questions have been treated in the past there doesn’t seem much point in asking. Three weeks ago the Barnet Eye published a leaked document summarising the shortlisting evaluation of bidders for the Development and Regulatory Outsourcing project. It wasn’t up for long before Rog T received a legal letter asking him to remove the leaked document from his website. Subsequently I noticed that there was a link to this document on Kate Belgrave's site and put a link on my website. In error, I said that this leaked document was posted on Kate's site which was incorrect. All Kate had done was include a link to a download site. I do not know who posted the document on this download site but I am assured it is absolutely nothing to do with Kate Belgrave nor is it anything to do with me. To Barnet Council readers, please note this correction and back off Kate. 1. How many questions were submitted by the public? 2. Of the questions submitted, how many were ruled invalid for failing to meet the new criteria for question submission. As so often happens to Barnet bloggers, the council failed to answer my question within the required 20 days so I sent a reminder. Six days after my reminder I did receive a reply which set out the how many questions were asked at the residents forum (not as I had requested the number of questions submitted) but declined to supply the information for question 2 on the basis that the council does not hold this information. That came as somewhat of a surprise to me given that a Council Governance officer had emailed me to tell me that one specific question I had asked did not cover “the type of issues to be discussed at Residents Forum meetings” and therefore would not be included on the issues list. I know that other residents also had questions rejected so I immediately submitted a request for an internal review on 25th October. This should also be completed within 20 days – Not in Barnet. Following several follow up reminders I eventually received a response on 10 February, more than 2 months late. Surprise, surprise the reply had a distinct whiff of the Kafkaesque about it. The number of questions submitted by the public which were refused is not recorded. By way of further explanation, I would like to clarify our initial response to your first question. The figures which were provided to you were the number of questions and petitions submitted and considered by the Residents Forums. These statistics came from the published minutes of each of the Forums concerned. The purpose of these minutes is to record the matters dealt with at each of the respective meetings. As the minutes only cover the Forum Meeting’s actual proceedings, neither the number nor nature of questions which were not considered at the meetings, are not recorded in the meeting minutes. So there you have it. Because something is not in the official minutes of a meeting it doesn’t exist. I have been offered the opportunity to ask about a specific question I submitted and why it was rejected but this does not tell me how many other residents had their questions rejected. What is really sad about this situation is that a 2 minute telephone conversation to the Council’s governance officers who deal with residents forums would have elicited this answer as recorded in the relevant emails. But not in Barnet. There is something increasingly sinister about the way Barnet Council deals with any resident who seeks to in any way challenge the authority of the Council. I want to add at this stage that I do not think all of Barnet Council is bad. Indeed, my direct experience is that many of the front line staff are exceptionally helpful, constructive and polite, something which I feel will be difficult to maintain once many of council's services are outourced later this year. Today I shall be making a formal complaint to the Information Commissioner, my first, but definitely not the first concerning Barnet. The results of the frankly bizarre and utterly meaningless Barnet Council business plan, budget and corporate plan consultations have been published in the cabinet papers for 20 February. The on line budget consultation attracted only 25 responses. It does say that “Due to the small sample size the overall findings should be treated with caution”. Perhaps “chuck it in the bin” might be a more suitable response. Then we come on to the corporate plan consultation. This consultation asked people to prioritise what services were important to the community and to themselves. At least this consultation attracted more response - 109 people. Yes out of the 350,000 residents of Barnet, the council managed to ‘engage with’ 109 people to fill in the consultation. To bolster the results they sent the consultation to the 1,000 members of the Citizen Panel of which 491 responded. So in total we have a total of 599 results, hardly confidence inspiring. I criticised the survey when it was first published as being meaningless and I would suggest my forecasts were quite accurate. People were asked to pick the eight most important services provided by the council to them personally and to the community as a whole out of a list of 28 services. 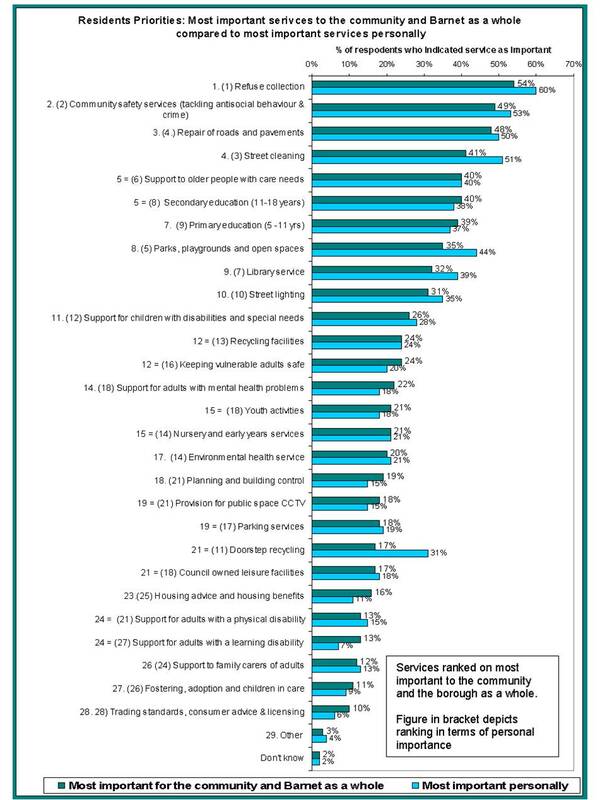 Not surprisingly people rated services that are important to the community very similar to the services that important to them personally. Refuse collection was significantly the most frequently mentioned service as being important to the borough as a whole (54%), followed by community safety services (49%), repairs of roads and pavements (48%) and street cleaning services (41%). However, around half of respondents did not indicate that these services were one of the most eight important services for the Council to focus on for Barnet as a whole, indicating opinion was divided. So what on earth does that tell you. Absolutely nothing! So what conclusion can they draw from that. 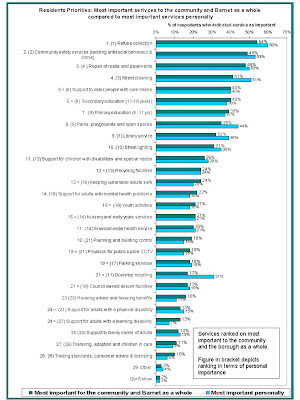 Are these essential services for the most vulnerable to be dropped because 599 people didn’t rank them highly enough. I have an acronim for this type of meaningless question. SFW (So F****ng What). Interestingly, when they asked people about areas where the council could save money the top answer was Review salary and expenses packages for 'top' and senior council Employees closely followed at joint third place by Review remuneration and expenses of councillors. They also held what they call a deliberative event where 74 people from the Citizens Panel were invited to ‘deliberate’. And at the end of it all, what conclusions did this extensive and probably very expensive consultation exercise. Ain’t got a clue and how on earth this can inform the decision making process I simply do not know. Perhaps the council should stop messing about with these pointless, crass and utterly inconclusive consultations and just start engaging with the community. Try listening to people at residents forums – where we were forbidden from discussing the budget consultation and stop wasting our money. Oakhill Park Bin Lorry Depot - What is the truth? Thanks yet again must go to Mr Mustard who passed on the response to a Freedom of Information Request he received this morning. Knowing that I had blogged previously about the Council considering using Oakhill Park for a bin lorry depot when the main Mill Hill depot is sold off he thought I should see the response. Frankly I am utterly shocked and no longer know who to believe. Cllr Evangeli reassured me that the bin lorry depot in Oakhill Park will not go ahead. Cllr Rams tweated that it would not be going ahead because he had stopped it. So what was the response from the Council this morning. As per the published Council budget, a total of £12.1m is currently allocated for the re-provision of depot services. From this £12.1m a maximum of £2.4m has been earmarked for the redevelopment of the Copthall & Oakhill Parks & Cleansing Area Operations sites. So the question is who is telling the truth, a council officer in a Freedom of Information Request response sent today or the assurances of two local councillors back in December. Every single resident in New Barnet, East Barnet and Brunswick Park should be concerned about this. It's all very well getting a verbal denial that something is happening but when you see that millions in cash have been allocated for the redevelopment of our local park as a 'Cleansing Area Operations Site' you should start to get very worried. Who’s Got A Nice Big Pension Pot? First of all massive thanks to the eagle eyed Mr Mustard who tipped me off to this story. Last year, having reviewed Barnet Council’s annual audit, I noticed that a few members of staff had been paid, in total, over £1 million in compensation for loss of office (when staff leave their job). At the time I remarked about the very significant sum paid to the former Executive Director for Environment and Development who received £280,485 upon leaving the Council. So it was with interest that I reviewed the London Development Agency Statement of Accounts for the year ending 31 March 2010 to see that a certain Mr A Travers had received just £8,575 compensation for loss of office when he departed from the LDA. A modest sum by all accounts but then again he did receive £162,595 in salary. However, when you scan across the line a rather large figure jumps out. Pension contributions £437,797 of which, £417,473 was paid as early retirement costs. It also notes that Mr Travers was seconded to London Borough of Barnet from January to March 2010 at a cost to the Borough of £44,957 including salary and on costs. So Mr Travers was employed by the LDA; he was then seconded to Barnet Council for three months from January to March 2010 and then very neatly he started his consultancy contract through Halliford Associates at £1,000 a day with Barnet Council on 12 April 2010. Very convenient timing for someone who had just received such a large pension fund top up for “early retirement costs”. At a time when everyone is suffering hardship it seems that some are suffering less than others. Oh and by the way, I thought I would have a look at the Board of the LDA at the time to see who was a member these events took place. What a surprise when I saw that a certain Cllr Michael Freer from London Borough of Barnet was one of the board of the LDA at the time. Perhaps I should leave it there and let people form their own views. Mr Reasonable has shown a great interest in the leisure facilities in Barnet for several years, largely because of Barnet’s determined approach to run the leisure facilities into the ground. At Residents Forums over the last three and a half years I have been asking questions as to when the Council are going to start taking leisure seriously. One thing I have repeatedly asked for is a leisure strategy starting with a sports facilities audit. Until you know the condition of your current facilities and how much life they have remaining, how can you plan what you need over the next 20 years? The response from Barnet was: “The Council will produce a leisure facilities strategy in 2009/10. Discussion of the scope and timescale will begin soon but accordingly no public consultation or any other part of the work has yet been scheduled". Now move on 18 months to July 2010 and I was still chasing for the Leisure Strategy. Unfortunately Barnet Council told me that: “We are in the process of starting a piece of work around forming a Leisure Facilities Strategy this strategy will show the facilities we have their age, location and what activities are offered. The strategy will also look at the growth in population the councils expects in the coming years. From this we will look to bring in funding and investment where possible but at this time there is no long term plan for the leisure facilities in Barnet”. Barnet pulled out some figures about the provision of swimming pools that were completely and utterly wrong. When I asked for the evidence they provided a long list of leisure clubs in Barnet including LA Fitness and David Lloyd. I was told that they counted towards the provision of swimming pools in Barnet because they offer “community usage” i.e. you can buy a day pass. A friend of mine who was also concerned about this problem (and a true community champion) rang around the various clubs and found that the cheapest day pass was £15/person with several operators not allowing day visitors. So yes we have lots of leisure facilities in Barnet but at £60 for a family of four for a single day pass or a family annual membership of over £1,000 a year it is definitely beyond the reach of many. Nevertheless the chap from Barnet Council agreed that we could have a meeting to talk about the forthcoming strategy and an appointment at NLBP in August 2010 was confirmed. Sadly just a week later the meeting was postponed indefinitely. Jump forward a year and in September 2011 the Cabinet consider a report on the “Strategic Leisure Review” where the main thrust of the report was how to cut £1.2 million out of the Leisure Budget in the next two years. Given that the current spend is only £1.7 million per annum that represents a cut of 35%. In the report it talks about “detailed consultation, which will be carried out with users and non-users of the leisure facilities, will support this objective and will enable an understanding of the changing user and resident needs in all sections of the community, including those members of the community who are protected under equalities legislation”. As a follow up to the cabinet meeting, a public consultation was listed on the wonderfully difficult to find and expensive consultation hub website http://engage.barnet.gov.uk/. However since that time the consultation has been postponed twice. The last time it was postponed, in December, the public consultation was rescheduled to commence on 1 February. I duly logged on at 9.00 am all ready to give my views but no it was still showing as about to commence. I tried to email on the link given on the website but that didn’t work – what a surprise. In the afternoon I was told that this consultation has been handed over to the Council’s One Barnet Implementation Partner, Agilisys/iMPOWER because the Leisure Strategy is now a “One Barnet project”. But do they have the requisite skills I wondered. No, so Agilisys/iMPOWER have drafted in a leisure expert, Duncan Wood-Allum from a specialist consultancy Sport, Leisure, Culture Consultancy . Apparently he will be preparing the strategic overview case which will then go to Cabinet and if approved will move forward to the business case. The problem is that once again the agenda will be set by a consultant and residents will only get consulted on the options the consultant determines are best for us. Residents will once again get left out of the policy development stage - it seems to be the One Barnet way. What I want to know is how the council gets away with it - public consultation cancelled, no facilities audit and why the hell have the council designated this a One Barnet project and employed yet another expensive consultant. The Council have p****d about for almost four years on this review, they have failed to engage with the public and now they want to spend a fortune on yet another consultant. In the last 18 months Barnet have paid Agilisys/iMPOWER £1.6 million on One Barnet, money that could have gone into delivering services and they now want to spend even more. Sadly I won’t be able to ask any more questions about the leisure review at Residents Forum because that is policy and One Barnet and therefore banned under the current repressive regime. Barnet Council is yet again demonstrating its utter contempt for the public.